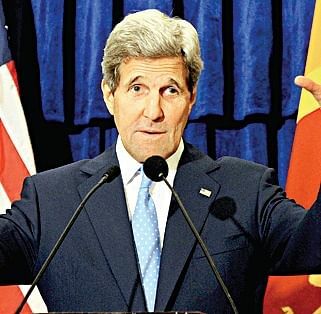 COLOMBO:US Secretary of State John Kerry, who left Sri Lanka on Sunday after a day’s visit, urged Tamil and Sinhalese leaders not to exacerbate the ethnic problem in the island nation by taking extreme and inflexible positions but to work towards a mutually acceptable settlement. Kerry told a delegation of the Tamil National Alliance (TNA) prior to his departure, that the US will continue to pursue the question of war crimes and accountability at the UN Human Rights Council (UNHRC), but Washington also expects the Tamil and Sinhalese leaders of Sri Lanka to take a constructive approach to the issue and not act in ways that prevent a mutually acceptable settlement from emerging. According to TNA MP, M A Sumanthiran, Kerry said that he was not asking the Tamils to give up their stand on issues of concern to them, but to work towards a mutually acceptable settlement with the Sinhalese majority. The high-powered Tamil National Alliance delegation that met Kerry comprised Northern Province Chief Minister C V Wigneswaran, and TNA MPs R Sampanthan, Mavai Senathirajah, M A Sumanthiran, Suresh Premachandran and Selvam Adaikalanathan. In his public lecture on Saturday, Kerry said the Lankan military should not be used for policing civilians at home. It could be used to police the world’s sea lanes and participate in peacekeeping operations abroad, he said. The US Secretary of State stressed the need to go to great lengths to get information about missing people as the US itself did, under his leadership, after the Vietnam War. “It’s an essential part of the healing process,” he said. Kerry said that it would be wrong to give accountability the short shrift and ask the victims of war to forget the past and get on with their lives. If this approach is taken, it is more likely that the victims will cling to the past more tenaciously than before, he warned. And to establish accountability, a good justice system is essential, he added. Finally, Kerry appealed to Lanka to cooperate with the ongoing UN war crimes investigation process and offered US help to do so.